Kathmandu Metropolitan City (KMC) on Saturday launched ‘City Beautification Aid Programme’. City officials aim cleaning drainages, removing unwanted ramps, dust, and garbage from Ratna Park, Bagbazar, Dilli Bazaar, and Maitidevi area. Speaking at the launch event in Santi Batika, Ratna Park, KMC Mayor Bidya Sundar Shakya said the metropolis shall leave no stone unturned to clean the city. “The metropolis alone cannot keep our city clean and dust free. All the stakeholders have come together for the cleanliness drive, to make the metropolis a liveable city,” said Shakya. KMC’s Deputy Mayor Hari Prabha Khadgi, Chief Executive Officer Yadav Prasad Koirala, DoR’s Director General Rabindra Nath Shrestha, officials from Prime Minister and Council of Ministers Office, representatives from KUKL, officials from NEA, officials from MWSP, Nepal Police, Nepal Army and Traffic Police attended the launch event. The metropolis has now rolled out the city beautification plan after it failed to deliver a tangible result from its ‘Clean The City’ drive. Making the metropolis a ‘no mask’ city was Mayor Shakya’s priority among 101 commitments after his joined office as the newly elected mayor on May 31, last year. “Earlier it was KMC’s sole effort, but now we have already added other stakeholders, and this will definitely work,” said Shakya. The Office of Prime Minister and the Council of Minister on November 2, had directed the concerned government officials to expedite the work of refilling the potholes of the main roads of the Capital within two months. 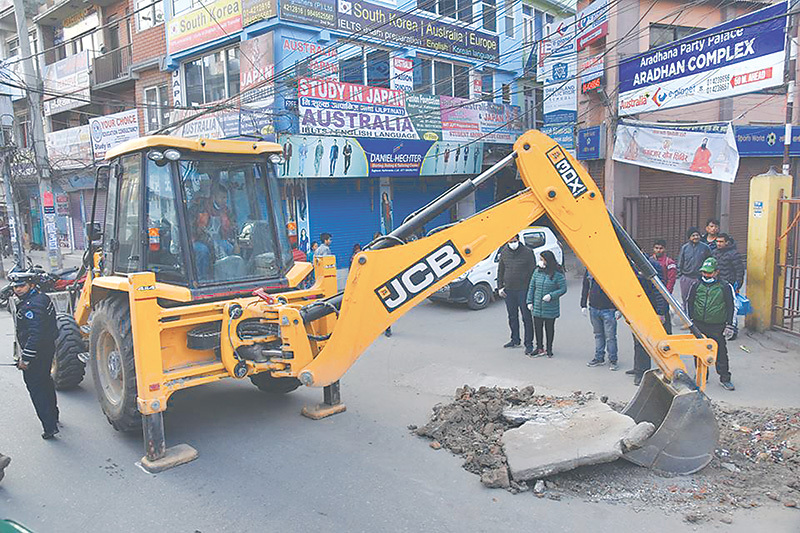 KMC Environment Division Chief Hari Kumar Shrestha, said the civic staff have removed three tonnes of dust and solid waste from the area and the drive will continue every Saturday. On October 29, the metropolis had summoned all the stakeholders including Department of Road (DoR), Nepal Electricity Authority (NEA), Kathmandu Upatyaka Khanepani Limited (KUKL), Nepal Telecom (NT) to work together for the beautification of the city. Due to the ongoing Melamchi pipe laying and road expansion task, major roads of the metropolis are covered with unbearable dust, and the whole city is suffering because of the air pollution. Mayor Shakya said the metropolis is planning to bring five new broomer machines. Further, the potholes will be fixed because there’s better co-ordination between DoR and Melamchi Water Supply Project (MWSP) and other government stakeholders.